After reading through your explanation I think this is a tidy solution. By the time I got to your small-multiples I was able to digest the information quickly and easily. It drew me in, it’s attractive (an important aspect I think), and it transmits the data well. I do however wonder what I would think if I just jumped to the end skipping the explanation. I don’t think I’d understand what I was staring at – but I suspect you know that. So I think the challenge is to explain how the graphic works without using much of your user’s time. The main leap is that the “negative” (downward) bars have a “positive” meaning on the same scale as the upward bars. (This kind of thing will give the Stephen Few’s of the world an aneurysm..). However I suspect a 10 second animation that starts with the original histogram, flips it, then shifts the bottom – followed by some annotation, would be all that’s needed. But maybe that’s too much to ask a user? So I think that’s the challenge – but if you clear that hurdle, I think this is a pretty effective way to look at this. Particularly because it makes me want to explore more of this data in this form… I’d browse just out of curiosity, so at least in that sense I think it’s a successful start. 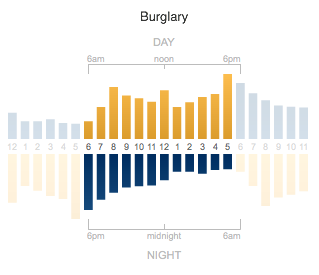 Ideologically a nice way to show a city’s, day and night time, data.Try flipping the nighttime horizontally. I think the chart will become easier to read, and as a side effect become better looking esthetically towards the skyline/water-reflection theme. Great stuff. 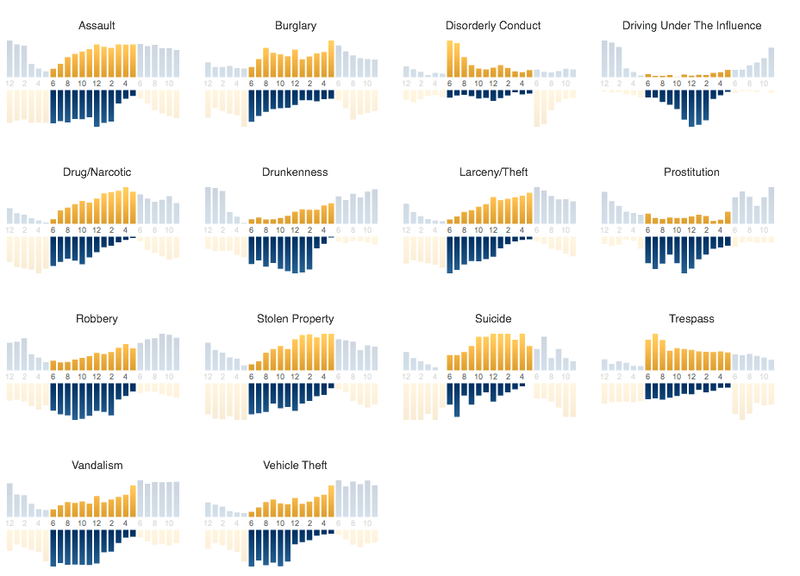 I’m always looking at new and wonderful ways to look at data and information. I didn’t see mention of any constraints that would lead you to not use a cyclical representation. Was there some impetus to keep it linear as opposed to the logical and cognitively congruent circular, clock, or polar representation? Tom – that’s a great point. I have a few points about cyclical charts. First, I’m planning on experimenting with cyclical charts in the future, so stay tuned for some more circular experiments. But I do have a problem with circular representations, which is that I don’t think they provide good context for different times of the day. Circular representations typically show all 24 hours on one circle and start with 12am at the top of the circle. That means that “morning” is roughly in the bottom right section, afternoon is the bottom left section, evening is the top-left and late-night is the top-right. There’s nothing inherently bad with that, but I don’t think it’s intuitive to know where to look to find the trend for a given time of day you’re interested in. If I know I’m interested in crimes that occur in the morning, for instance, I have to know to look somewhere along the bottom-right side of the circle. 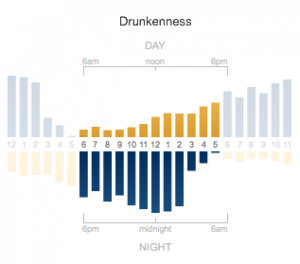 Whereas with linear charts you can frame the data within the context of the day. My chart frames the day so you can easily pick out different times of day, like morning (the start of the top highlighted range). A second point is that people may not intuitively think in circular forms, but instead in linear forms. There’s a dissertation that tried to study this concept, and they found that when asked to draw cycles (like the seasons of the year, etc), the majority of people drew them linearly, not circularly. While I’m not saying this one small study proves anything about whether linear representations are better than circular representations, I find the concept fascinating. Personally I do find reading linear charts to be very intuitive, and I think I struggle a bit trying to understand circular ones. So I wanted to try my hand at a linear representation. Let’s look at your linear charts–comparing data from say 11am every day over a year–But 11am is not the ‘same time’ throughout the year. Not only do our clocks change during several times of the year, but considerations such as the length of daylight alters dramatically at different times of the year, along with many more variables, all of which can affect any kind of data accumulation like this. 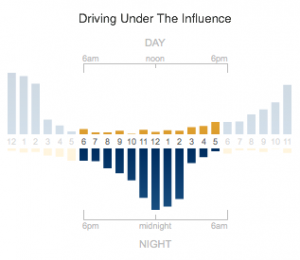 Take you DUI example–It’s no coincidence that in most States, more accidents occur in Winter than in Summer (including DUIs) with the effect of diminishing sunlight an obvious factor. The bars going up are bad…no wait, the bars going down are bad. 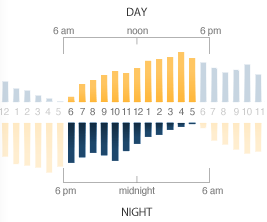 This chart requires a context switch when you compare day vs night. Also, maybe focusing on the ‘unit of a day’ is a problem. Kinda like focusing on a tree instead of the forest. String together a week and I can easily see the cyclic ups and downs, I can see a pattern in day vs night. Instead of 1 day and N categories in a row, why not 1 category, 1 week, in 1 row. 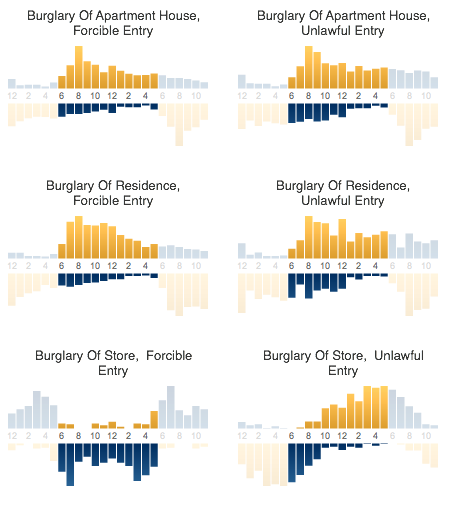 With each category per row, there’s opportunity to not only see the cycles, but to compare cycles against other crimes, to overlay. I’m with Ash: I am confused about the antiparallel directions of the bars in your proposed chart. Even after consciously telling myself that both directions are positive, I am confused. If you were to simply make two panels in a similar fashion, but make both panels start at the bottom and values increase in the upward direction, it would eliminate this confusion.